Krishnan Sasikiran (born January 7, 1981) is an Indian chess grandmaster. He was one of Viswanathan Anand's seconds in the World Chess Championship 2013. Born in Chennai, Sasikiran won the Indian Chess Championship for the first time in 1999 and won it again in 2002, 2003 and 2013. Sasikiran earned the Grandmaster title at the 2000 Commonwealth Championship. In 2001, he won the prestigious Hastings International Chess tournament. In 2003, he won the 4th Asian Individual Championship as well as the Politiken Cup in Copenhagen. Sasikiran tied with Jan Timman for first place in the 2005 Sigeman Tournament in Copenhagen/Malmö. In 2009, he tied for 2nd-3rd with Étienne Bacrot in Antwerp. In the January 2007 FIDE rating list, Sasikiran was ranked number 21 in the world with an Elo rating of 2700. He became only the second chess player from India to reach Elo rating of 2700. He won a gold medal in the 2006 Asian Games' team event. Tamil Nadu government presented a cheque of Rs 20 Lacs as appreciation for his success. He was also bestowed with the Arjuna Award in 2002. 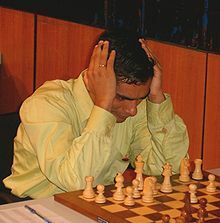 In December 2008, he won City of Pamplona international chess tournament, a category 16 event with average Elo above 2640, by one-point margin with a rating performance of 2795. In May 2011, Sasikiran won the Asian Blitz Champioship in Mashhad on tiebreak over Wesley So and Bu Xiangzhi, after all finished on 7/9 points. In October of the same year, he placed clear first in the open section of the 15th Corsican Circuit. He reached semi-final stage of the Corsica Masters knockout rapid tournament losing to eventual winner Anand. At the 2014 Chess Olympiad in Tromsø he scored 7.5/10 points on board three to help the Indian team to win the bronze medal. Sasikiran completed his education in the Modern Senior Secondary School of Nanganallur, Chennai. He is married to Radhika and has a daughter.